The war seemed all but over. Germany had surrendered in May, and much of Hiroshima and Nagasaki were in ruins, decimated by atomic bombs dropped the previous week. If Yellin heard a code word – “Utah” – Japan's rumored surrender had occurred, and he was to cancel his mission and return to Iwo Jima, a rocky island that he had helped secure months earlier and that offered a base for American bombers headed north to Japan. Later that day, on what was still Aug. 14 in the United States, Emperor Hirohito announced Japan's surrender. For some reason, however, Yellin and Schlamberg never got the message. Taking on antiaircraft fire in their P-51 Mustangs, they strafed their targets and headed home, passing through a thick bank of clouds. Schlamberg, who had previously admitted a sense of foreboding to Yellin, saying, “If we go on this mission, I'm not coming back,” never emerged from the haze. Disappearing from Yellin's wing, he was presumed dead and considered one of the last Americans to be killed in combat during World War II. Yellin, who landed on Iwo Jima to discover that the war had ended three hours earlier, and who later became an outspoken advocate of veterans with post-traumatic stress disorder, died Dec. 21 at his son Steven Yellin's home in Orlando, Florida. He was 93 and had lung cancer, his son said. Yellin joined 86 military veterans on an Honor Flight from Fort Wayne in October 2015 at age 91. 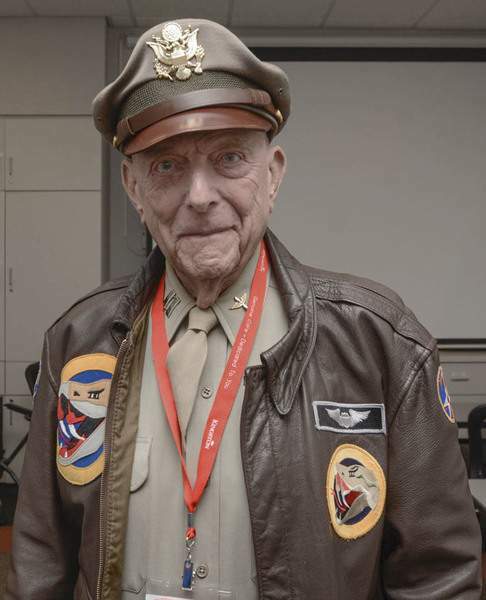 It had been his first Honor Flight, but not the first time he'd seen the memorials in Washington, D.C.
Yellin, a captain in the 78th Fighter Squadron of the Army Air Forces, counted 16 downed pilots in his unit during the war, including Schlamberg. For years afterward, he struggled to keep a steady job, moving a dozen times in the United States and Israel (where he settled, at one point, partly in protest of the Vietnam War). Yellin soon began speaking to other veterans who struggled to adapt to civilian life, and in 2010 he co-founded Operation Warrior Wellness, a division of the David Lynch Foundation that helps veterans learn Transcendental Meditation. He said he was inspired to start the group after a friend and Army veteran killed himself that year. Yellin received support in promotional videos by actress Scarlett Johansson, a grandniece of Schlamberg. “The feeling that one has when a buddy dies? You just can't emulate that. We have a burden civilians will never understand,” Yellin told The Washington Post earlier this month, shortly after the release of “The Last Fighter Pilot,” an account of his World War II service written with Don Brown. Jerome Yellin was born into a Jewish family in Newark, New Jersey, on Feb. 15, 1924. His father was a real estate developer. Yellin had just graduated from high school in Hillside, New Jersey, and was working the night shift at a steel mill, saving money before starting college, when Japanese forces bombed Pearl Harbor on Dec. 7, 1941. Two months later, on his 18th birthday, he enlisted in the Army Air Forces, pursuing an adolescent love of aviation that had led him to build models of World War I-era planes. Yellin was slightly nearsighted and initially failed an eye exam for pilots. “The doctor told me to go home and stay in a dark room, eat a lot of carrots, don't read anything and come back in three days and take the test again,” he said in a 2014 oral history. Yellin proved a skilled pilot, successfully bailing out of his plane when the engine locked up during a training mission near Hawaii (he said he spent nine hours in a life raft before he was picked up by a boat) and escorting B-29 bombers on 19 missions over Japan. His military honors included the Distinguished Flying Cross and Air Medal, and in recent years he served as the national spokesman for the Spirit of '45, a nonprofit organization that promotes the legacy of World War II veterans. The Journal Gazette contributed to this story.